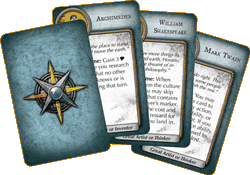 There are several new features and mechanics that are introduced, as well as updates to the core game, and even some extra reference materials and updated components. 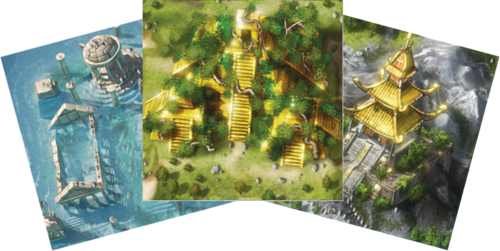 Core game enhancements include four new civilizations, new map tiles, combat reference cards, new technology and culture cards, new wonders, new village and huts, and components for a fifth player (with pretty, royal purple pieces). In addition, the rule book contains some clarifications for certain rules which were never explained in the original manual or FAQ. In addition to enhancements to the base game, there are several new modular mechanics that can be mixed and matched as the players see fit. 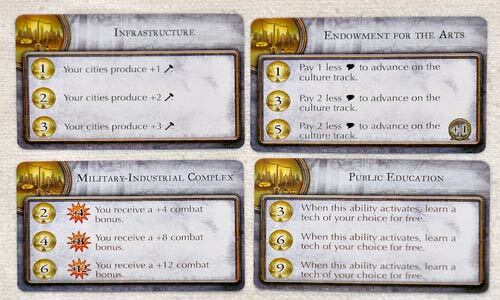 Gold coins can now be "invested" into permanent enhancements to your civilization; great people now come with cards that grant the player special powers that are representative of the individual’s contributions to the world; the capital city can now grow to become a two-tile "metropolis"; and city production or defenses can be boosted with caravans or fortifications. The new components are all marked with a special icon, so if you ever want to go back to playing the base game, you can easily remove the non-applicable components (this is a standard feature for modern board game expansions). The upgrades that have been applied to the base game are almost universally positive. Finding one of these ancient ruins provides a unique one-time bonus. There’s now a wider variety of map configurations and new incentives to explore early in order to acquire unique benefits. There’s three new map tiles called "relics" which are similar to the "goody huts" or "ancient ruins" of the computer game in that they provide a unique benefit. These tiles are a bit fanciful, which may turn some gamers off, but considering that the board game has a more light and casual feel than the computer game, I don’t mind them too much. 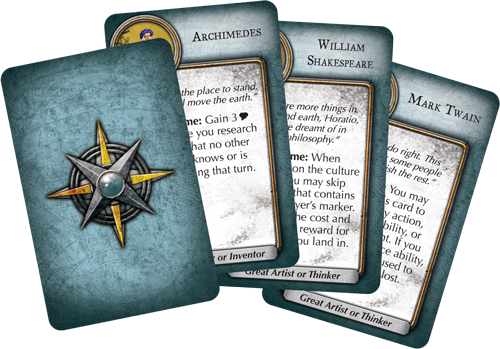 Discovering Atlantis grants you a free technology, the School of Confucius grants two free great people, and the Seven Cities of Gold provide two free investments. In addition, there’s some new villages and huts that can offer free culture, free production, a gold coin, a free Level I technology, or a free infantry unit. These are fun and add extra incentive to explore the map to try to secure these powerful early-game bonuses. There are two new temporary buffs that can be applied to cities: fortifications and caravans. Both require the player to disband one of their army or scout figures. You can disband an army figure in order to place a fortification on the city, which increases the city’s combat bonus by 2. This is a valuable bonus if you know you can’t possibly match up against your opponent on the open field, and it’s especially important since you there are new "loot" rules for combat victories that can be especially significant swings in game momentum. So you’re better off fortifying in your cities than risking your figures and units in the open field against a more powerful opponent. The caravans are pretty lame though. You can disband a scout figure in a city in order to increase its production by 2 on a subsequent turn. This action seems very wasteful to me though, since the same result can be achieved without sacrificing the scout by just camping your scout on a forest tile and "gather" the resource for that city (which is one of my favorite mechanics in the board game). A scout costs 6 production to build, so throwing one away to only gain 2 production is excessively inefficient, and I’m really not sure why you would do this unless you are absolutely desperate. But maybe that’s the point; maybe it is included as an act of desperation in the case that moving your scout away from cities is too risky. If so, I guess it makes sense. India's metropolis spanning across a water tile (creates a "land bridge"). Another new city-based mechanic is that you can expand your capital into a "metropolis" which takes up 2 adjoining tiles (which gives your capital access to 2 additional tiles’ worth of resources and beefs its defense). Expanding your capital to a metropolis is almost a necessary action, but it requires you to research a new technology, "Agriculture", which exists solely for this purpose. It can sometimes feel like a bit of a waste if there’s more valuable techs for you to get, but if you delay too long, then you’re likely to fall behind in production and lose access to wonders and so forth. The metropolis feature also requires you to plan your early expansion much more carefully, since you still can’t overlap your metropolis with other cities, and expanding the metropolis onto a tile that contains a building will destroy the building. You need to make sure you leave room to expand! One thing that is very fun and interesting about this mechanic, though, is that you are allowed to expand a metropolis onto water squares! You can therefore use your metropolis as a bridge across tile-wide water. In addition to enhancements to the base game rules, there are two new modular features that can have dramatic impacts on how the game progresses. These features are both optional and are easy to add or remove during setup. In the base game, Great People were earned by progressing on the culture track, but they were basically just buildings that added yields to tiles. They could be game-changing if acquired early, but late-game buildings usually ended up being better than any Great Person anyway. Great People now provide unique bonuses that can turn the tide of the game. Now, each time you get a Great Person, instead of just drawing a tile, you draw a Great Person card and then find the appropriate tile type for the card drawn. You still get to place the Great Person tile just as you would in the base game, but each card now depicts a unique Great Person, each with a unique power. Some of these are face-up passive buffs, such as Henry Ford increasing the movement speed of all figures; others are secret, face-down, one-time use, such as Isaac Newton, who allows you to place his card in a legal spot on the tech tree in place of a technology, which can give you access to a higher-tier tech. These powers can be very useful, and can really change the dynamic of the game in fun, and sometimes frustrating, ways. Losing a battle that you thought was a guaranteed win because your opponent plays a Great Person card that you didn’t anticipate can be very frustrating. Gaining access to these powers adds extra value to devoting your empire to culture, since advancing on the culture track is how you acquire Great People. In addition to the Great People, there are also new Cultural Event Cards with powerful abilities. Most of these either allow you to draw extra units into your hand for battles or force your opponents to discard gold coins (more on this later). Culture is now a much more powerful tool overall, and is much better integrated into the rest of the game. The new Great People and Culture Event Cards can really help you overcome any areas of the game that you are lacking in or further enhance an area that you are dominating in. Unfortunately though, you’re completely at the whim of random card draws, so you can’t count on getting a particular bonus to make up for a deficit in any given area. The other major new feature is the Investment system. This allows players to spend their collected gold coins towards one of a set of pre-set, permanent buffs for their empire. Each successive investment will become more expensive than the previous. Military-Industrial Complex: grants extra Combat Bonus. Public Education: grants free technologies. Endowment of the Arts: makes culture advancements cheaper. Infrastructure: increases the production of all your cities. These are powerful bonuses, but I have very mixed feelings about this feature. On the one hand, it’s nice that your gold coins have more use and can be integrated into other victory strategies. On the other hand, there are now a lot more ways to force players to discard their gold coins, so you are really under a lot of pressure to invest them. But when you invest them, you lose the gold coin, so each investment essentially pushes you even further away from an economic victory. This pressure to have to invest your coins almost completely nullifies the economic victory as a viable strategy! This limits your practical options, and hinders replayability for the game. Fantasy Flight tried to compensate for this by adding more ways to acquire gold coins, but you still just don’t hold onto them long enough to accumulate the 15 that are necessary to win the game. The rule book claims that you can opt to play without the Investment mechanic. The game is supposedly balanced to work either way. The only caveate is that you won't be able to play with Arabia using the abilities printed on their card (though you could always just house-rule a new set of abilities). I disagree with this assertion though, since (as I mentioned above) there are more ways to force players to discard gold coins. So even without the Investments eating up your coin, you may still find that the Economic Victory is a bit more challenging than it used to be, simply because other players will be killing your precious coins on a more frequent basis. This could have been resolved by putting gold coins on the investments cards. So, for example, investing 3 coins in the level 2 "Endowments for the Arts" could have maybe also granted 1 or 2 coins on the cards, which wouldn't be able to be killed by other players. The other cards would have similar functions. It would be a way of protecting your coin investments, while also getting other bonuses as well. But this isn't the case, and I feel that the Economic Victory has basically been cut from the game. The four new civs are Arabia, Greece, India, and Spain. Arabia’s special powers focus on the investment deck, so if you chose not to play with that feature, then Arabia cannot be selected. They also get free resources at the start of the game. Greece has a very powerful ability that can radically change the way that other players play the game. After Greece researches a technology that nobody knows or is researching that turn, they get to retain all the trade on their trade dial. This means that as long as they are researching unique techs, they get them for free! This is incredibly powerful, and can make it very easy for Greece to power through the tech tree unless the other players specifically chose to research the same techs as Greece in order to prevent this. It is much like how the players in the base game had to go out of their way to keep Russian scouts away from their cities. A clever Greek player can really wreak havoc with opponent’s strategies by forcing them to have to divert away from their intended victory path and research unuseful techs in order to prevent Greece from winning a technology victory. India gets to start with their capital being a metropolis, so you don’t have to worry about leaving room to expand it. They also can exchange a resource for any other resource except Uranium and get extra culture from tiles containing resources. India is incredibly potent when going for culture victories, but if the Indian player doesn’t spend time building units and figures, they can be easily overwhelmed. So India isn’t as powerful as Greece because their ability is much more easily countered by enemy armies. Spain is the last new civ, and they are also quite powerful! Spain starts with a bonus scout and has the extra white scout figure (similar to Russia’s white army figure in the base game). They also start with increased travel speed, can cross water, and can build a free building in any city whenever they uncover an unexplored map tile. This gives Spain a huge advantage in the early game because they can quickly grab most of the Workshop tiles right from the start. This power is similar to Egypt’s power in the base game, except that it doesn’t require an action in the city to use. Spain can effectively build two buildings in a single city in a single turn early in the game, or even three if they manage to get the Engineering tech while there are still unexplored map tiles. Alternatively, getting the free building frees up Spain early on to build early wonders. Spain and Greece’s overwhelming powers will paint a huge target on your face if you choose to play as one of them. All the other players will need to actively prevent Spain and Greece from utilizing their powers effectively, or else either civ can get off to an insurmountable head start. Watch out for those Spaniards and Greeks! This expansion adds some great new content and does a great job of integrating the different mechanics and victory types together. This gives the players much greater flexibility later in the game to change their strategy if one becomes untenable, and utilize their existing bonuses or progress towards a different victory approach. This helps to further balance the game overall and provides some useful catch-up mechanics if you fall behind early. 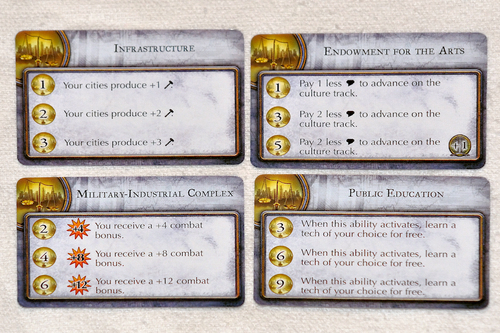 The Investments and Great People mechanics help to integrate the economic and culture paths with other victory types. The new combat loot rules also means that a single battle can swing the momentum one way or the other. Some players may complain about how random the Great People and Culture Event Cards can be, but I think they just add some fun and unpredictability to the game. I generally don’t like games that are easily optimizable because once you effectively "solve" the game, it becomes too mechanical and not very fun. A great example is Axis & Allies. These games have a pre-set starting configuration and the rules end up creating a set of optimal moves for the first few turns, and the game ends up coming down to which player gets the bad die roll. In that case, you might as well just not play A&A and just play dice instead! Civilization does a great job of avoiding this problem. The expansion also adds support for a fifth player. The game is already pretty long with four players, and the fifth player just adds more downtime. In addition, the board is oddly-configured for five players, in that it has a pentagonal shape with a large, impassable hole in the middle. 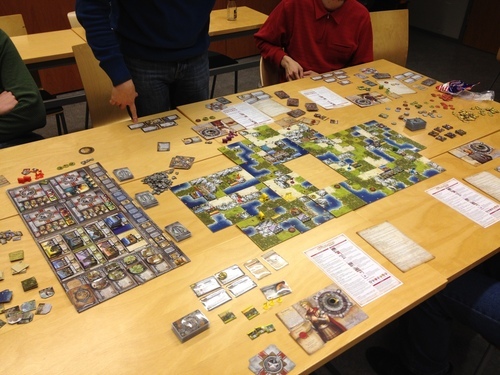 The 5-player setup includes a large, impassable hole in the middle of the board (image from Board Game Geek). It's awkward, but doesn't break the game in any way. 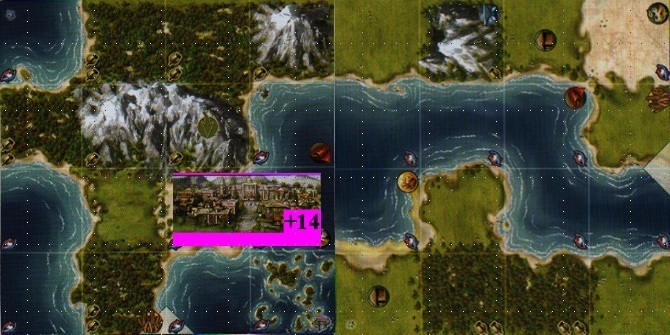 Furthermore, despite the addition of the fifth player, no new building tiles or unit cards were added to the game. This further compounds the already-existent problem of component limitations that is present in the three and four player games. Racing to acquire the workshop buildings is still a major component of the game, and it’s a shame that no scaling of component availability was added in order to keep the game’s feel consistent regardless of the number of players. The new components are easy to integrate into the base game, so little-to-no additional set up time is added. And, assuming you don’t separate the expansion content afterwards, there’s also no additional tear-down time. I was a little disappointed that the new civilizations didn't include a representative of Native America (either the Aztec, Inca, Iroquois, or Maya), but whatever. The expansion rules also don’t add much additional complexity to the game. There’s still a high learning curve (the base game is complicated), but the new rules are simple and elegant. There are also rule clarifications and better player aids included in the box. I love the Civilization board game! 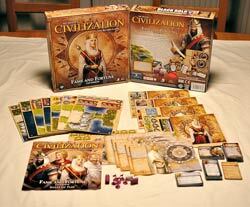 Possibly even more than the Civilization V PC game. With the new expansion, I like the board game even more. It creates a much more cohesive and robust package and gives new and interesting decisions for the player(s) to make. My only major hang up is that the economic victory has almost been eliminated as a viable victory path, but that isn’t a game-breaker for me. Fame and Fortune is a great expansion for a great game, and I highly recommend it! Well hello there! I just finished reading your entries on the base game and the expansion, and I agree with much of what you said. Have you seen anything on the ultimate balance of each win strategy type? As you suggested in your first piece, I can't imagine any strategy being particularly effective against the tech path. Have you seen many games where a tech strategy was defeated? Unfortunately, I haven't had much chances to play the game since posting this review. In the games that we did play, the Science/Tech/Space victory was always the one that everyone was rushing to get or beat. The best counter always seemed to be to just out-tech your opponent. Focusing on teching up your military so you can capture their cities and steal technologies, while simultaneously reducing their trade income, seems to be the best bet that I can see. If you have alternate strategies, please share! I am all ears!